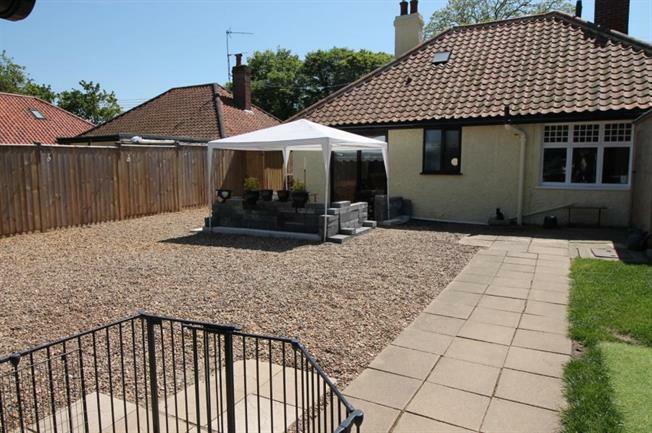 2 Bedroom Detached Bungalow For Sale in Norwich for Guide Price £280,000. This property's price has dropped from £325,000 to Guide Price £280,000. Old Dairy Land Lodge was originally built for farm workers over 120 years ago. The property has been completely renovated including a new roof, new central heating system, complete rewiring, new windows and doors, wood burners and new carpets and all come certificated and guaranteed. Located in the village of Great Plumstead with access to the new Northern Distributor road, the village offers wonderful countryside walks and is close to the larger village of Brundall, featuring a train station, shopping, amenities, and schools all within a short drive, with local buses running to the high schools. This private detached larger than average bungalow is set back from the road, the property overlooks fields and countryside the property is accessed by a double gated entrance with a large in and out driveway providing ample parking and fully enclosed by solid fence lines, there is also additional rear parking through vehicular double gates. The property itself consists of two double bedrooms, with the master boasting a charming belly pot stove working fireplace perfect for cosy warmth on winter nights. The lounge benefits from a wood burner and has plenty of light from the window at the front of the property. There is a further double bedroom, family bathroom and lovely farmhouse style kitchen with a mutli fuel stove, as well as outer hall to access the rear of the property. The rear garden is low maintenance with mainly patio and shingle areas along with lawned area and fully enclosed garden to rear. There is a barn outbuilding to the rear which has electricity and water and is part boarded offering potential to be used as an office or even converted into an annexe. The rear of the property also provides additional parking with vehicular access via a double gated entrance. The current vendors have full planning permission (2016/004190/BDC approval Number) for an extension consisting of kitchen and cloakroom, and there are footings to the rear ready for a conservatory and the potential to extend into the loft. This property is all ready to move into; come and appreciate the peace and quiet of the enviable location of this amazing property with fields and agricultural land to rear. window to the front with woodburner and carpets. Fully fitted farmhouse style kitchen diner with working feature woodburner, large window overlooking rear garden and door off to rear porch. The master bedroom is a generous size with fitted carpets, window to front and a working "pot belly stove" fireplace. The second bedroom is a double bedroom with patio doors to rear and carpets. This outbuilding is a great added extra to this property which could be used as an office an annexe or studio. The barn has been part boarded and has electricity and water.